Palestinian reporter and photographer Yasser Murtaja died after sustaining wounds inflicted by Israeli forces on the second Friday of Marches of Return, a Palestinian protest against Israel’s illegal seizure of Palestinian territories 70 years ago which coincides with Israel’s creation. Murtaja, 31, is the co-founder of Gaza-based TV production company Ain media. He did drone projects, including drone video, for foreign media clients such as BBC and Al Jazeera English, Israeli media Times of the Israel reports. He was father of a 2-year old baby. Murtaja was reportedly shot 200 meters from the Israeli security fence with Gaza. The local photographer was covering the second Friday of the Palestinian peaceful protest, which began late last month and expected to continue until mid-May, same date as the 70th celebration of Israel’s creation. Although Murtaja was wearing a flak jacket marked “press” he was shot at. He is the second person to die overnight of wounds in a death toll put at nine for the second day. 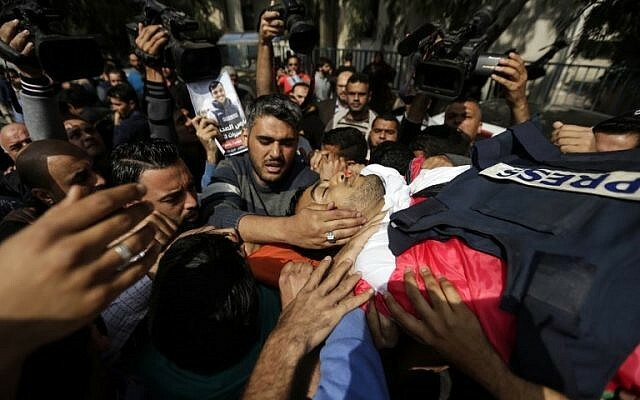 Around 500 people including 10 other journalists sustained injuries according to Gaza-managed medical services. Written by: KanelkaTagba on April 7, 2018. Last revised by: Jaber Ali, our reviewer, on April 8, 2018. Posted by KanelkaTagba on Apr 7 2018. Filed under Headlines, World News. You can follow any responses to this entry through the RSS 2.0. Both comments and pings are currently closed.